This solo project mail campaign is centered around H.P. Lovecraft’s Call of Cthulhu. It consists of four total mailings, three letters and a package. Every element, from the graphics, the typefaces, the papers and even the string and packing material was carefully considered to give the impression of a 1920’s correspondence. With each new letter, the recipient learns more about the twisted Cult of Cthulhu as told by the mysterious “Thurston”. 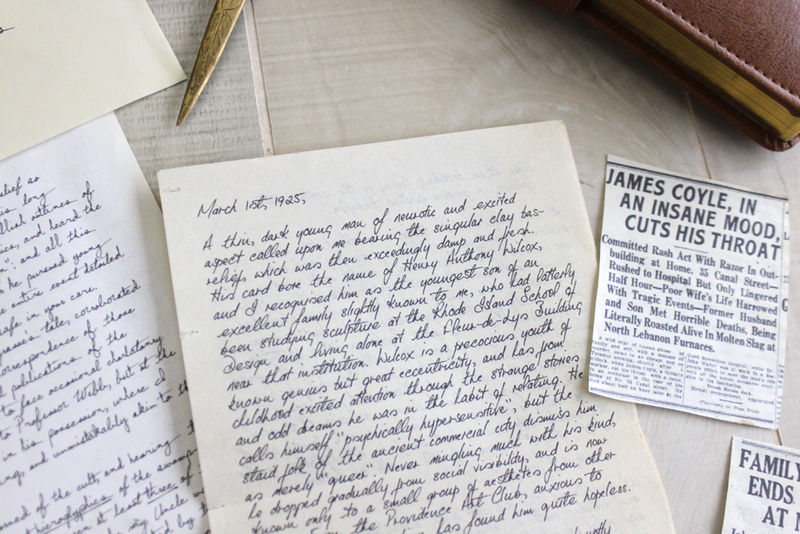 These letters are augmented by corroborating newspaper clippings, an aged key, and eventually a large package containing the cursed idols of Cthulhu. 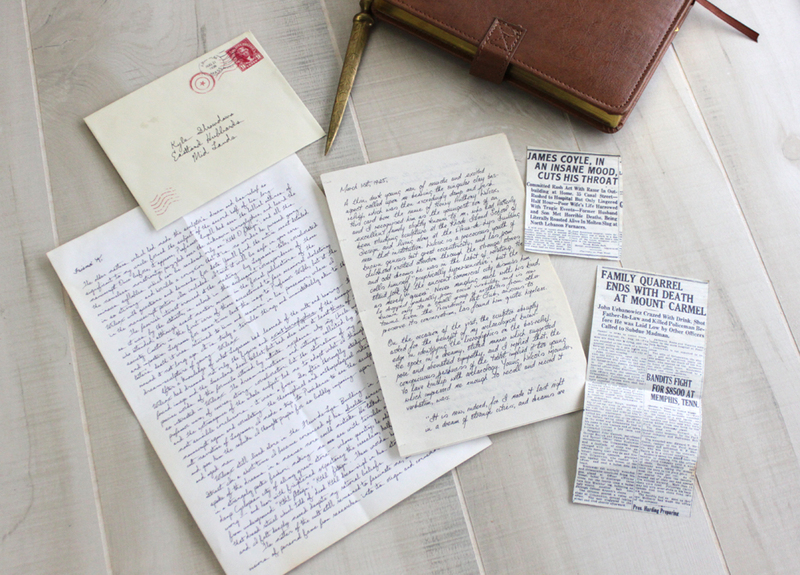 Each individual mailing contains several unique pieces, all meant to convince the recipient they are receiving letters from the past. Yellowed envelope with 1920s stamps. Stamp designs are original, printed on a cotton fiber paper and cut out with a papercraft machine to include the ubiquitous stamp perforations. Arkham postmark applied over the stamps. 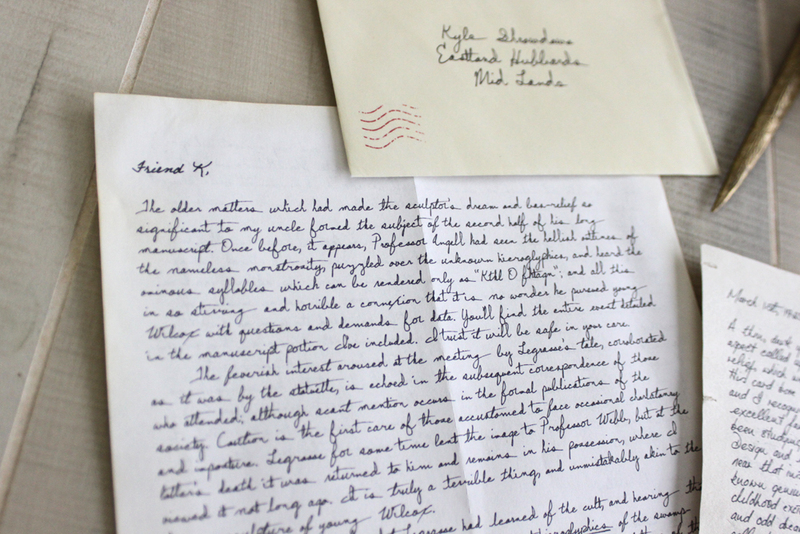 Letter composed by Thurston, written in a specialty typeface that uses hundreds of ligatures to create the impressive illusion of handwriting. The paper stock is a non-standard size and the edges of the paper have a dry, sun brittled patina accomplished with a heat gun. Small, torn out diary pages in an additional handwriting simulating typeface. The paper for these was authentic, and stripped from a bound diary. Two newsprint clippings used to corroborate the assertion by Thurston that people are going mad. 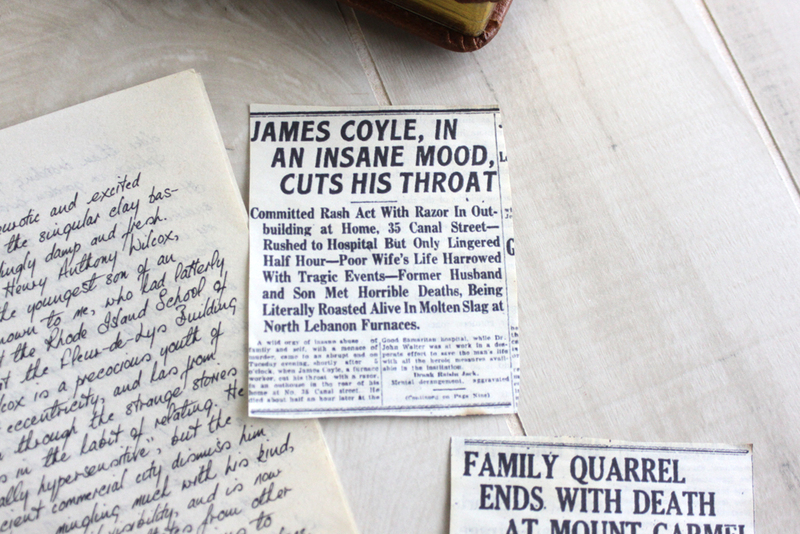 Clippings feature original articles from the 1920’s on the front, and additional partial articles and ads on the back. Articles are printed on a light newsprint with the same dry texture achieved via heat gun. Similar envelope treatment, but with natural-looking variation. Additional letter, this time in a slightly more hurried fashion, a bit askew. Additional diary pages, from a much earlier time period. Edges dry and bleached via heat gun. A small keyring, referenced in the first letter. The brass ring holds a skeleton key and a small padlock key. All materials were aged, the brass with vinegar and heat, the steel key with paint, wax and dirt. Final envelope with natural variation. Typed two page memoir on typewriter paper with aging effect. Paper is worn along the creases and appears to have been handled over years. 1920’s card file divider with original “Follow Up” raised label. 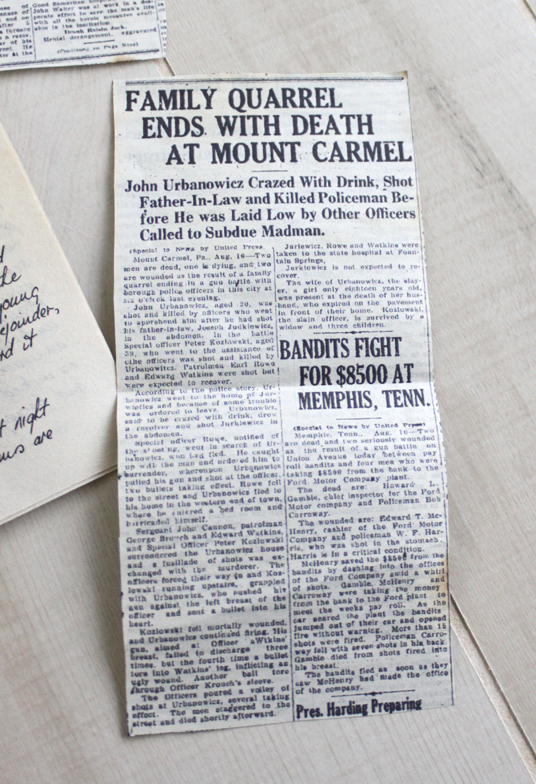 Newspaper clipping derived from the details provided in the memoir. Article with writing and layout to match original 1920’s publications, and image was edited to have the appearance of low-fidelity newspaper images of the 1920s. Reverse of the article includes 1920s advertisements. Solid cedar box wrapped in vintage paper and cotton string. Postage for the package is a combination of vintage stamps, and the address area is a cotton fiber label in handwriting. Several 1920s stamps and certificates were sourced to create a realistic “Inspection” label that was pasted over the string. The packaging is distressed and appears to have been handled roughly. Wood shavings line the interior of the box, keeping its contents secure. Inside a clay bas-relief as depicted in the Lovecraft story is signed by the fictitious artist “Wilcox” and a faux stone plastic idol rest. Under the contents the recipient discovers a copy of H.P. Lovecraft’s horror works, and a Cthulhu based card game.